YouTube has announced the latest addition to its very own video editor: automated caption translation for over 300 supported languages. The Caption Translation Manager utilizes Google's Translate and Translator Toolkit in order to work its magic. Alternatively, video authors can even crowd-source caption translation to community members. Since the popular video hosting platform already provides automatic caption generation using Google Translate's speech-to-text abilities, this makes it even easier to provide captions to a global audience. 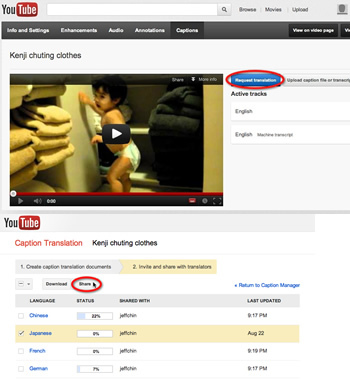 YouTube's video editor allows users to watch as they translate and even provides a "first draft" to follow, as performed by their automated translation technology. Entertainingly, the translation service also provides yet one more way to totally screw up video captions. Given how bad some of YouTube's same-language, machine-generated captions have proven to be, one can only imagine the kinds of funny results we'll see by making poor translations of bad transcriptions. In all fairness though, YouTube almost gets it right sometimes though. While automagically converting captions to nearly any language is no insignificant feature, there's one major benefit to YouTube and its users: more data. As video uploaders continue to make use of this tool, captions doubly serve as information about topics, events and everything else. In other words, what was once a ostensibly useless, indecipherable foreign video to one user may now actually hold informational value to that person. This should help add to the world's collective knowledge and hopefully chisel away at some of the barriers presented by different languages. YouTube has the instructions posted on their blog.